366 pages | 98 B/W Illus. 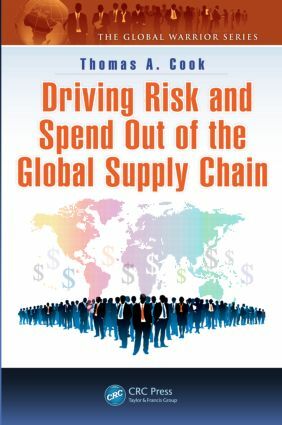 Driving Risk and Spend Out of the Global Supply Chain provides a complete picture of the various risks multinational firms face when they operate overseas and engage in foreign purchasing and sales, import and export trade, and global logistics. Thomas A. Cook, a subject matter expert on global trade management, supplies readers with step-by-step guidance on how to develop an airtight global risk strategy. The book examines all the areas where spend can be reduced and details a specific strategy to help readers reduce spend without compromising values. Providing the most comprehensive and up-to-date compilation of material and tactics currently available for international business professionals, the text supplies a clear understanding of the steps readers must take before taking any action to reduce risk and spend in their import, export, and domestic supply chain operations. How Do Loss and Damage Occur in International Shipping? What Are RFPs and RFQs? Thomas A. Cook has been involved in international business and global supply chain management for more than 30 years. He is a graduate of the NYS Merchant Marine Academy with a BS and MS in transportation and business management. He has spent more than six years in the U. S. Naval Reserve and the U. S. Merchant Marines. He founded American River International, a premiere logistics and supply chain management consulting company, in 1982. Last year he stepped down from his position as CEO and managing director and sold his company to existing shareholders. Cook is a subject matter expert on global trade management, and has published more than 12 books and 300 articles about international business, supply chain management, RFP, negotiation, and world business development. He has sat or currently sits on numerous boards and advisory groups that assist corporations, associations, and industry trade groups in the best practices of running their businesses. He sits or has sat on the board of, or is involved in corporate training with, the following companies: American Management Association (AMA), American Pet Products Association (APPA), Council of Supply Chain Management Professionals (CSCMP), Institute for Supply Management (ISM), and National Association of Purchasing Managers (NAPM), to name a few. Cook has experience in a number of subjects concerned with general management, including sales, negotiations, customer service, operations, supply chain, logistics, RFP management, business development, and training. He is cofounder of the World Academy, which equips international business executives and operational personnel in supply chain with the skills necessary to operate successfully in global trade. Currently, Cook is managing director of Blue Tiger International (www.bluetigerintl.com), a management consulting organization focused on international purchasing and RFP enhancements. He is also working on an eight book series entitled The Global Warrior (Taylor & Francis/ CRC Press). Each book gives strategies on the skill sets necessary for the corporate executive of the future to compete in global trade.